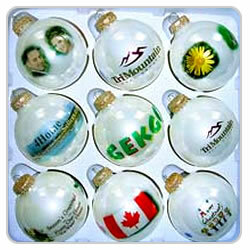 The All Seasons Orbit Printer - Printing Pictures on Your Christmas Balls | TonerGreen - Eco-Friendly Toners from the U.S. It's just a couple of days before Christmas is here and I'm sure everyone is enjoying decorating their house especially the Christmas tree. And since, I already provided you with two articles about Christmas trees then for today, I'm going to show you an incredible printer that can let you design your own Christmas balls with your pictures drew into it. Yes, and did I also mention that this printer I'm talking about is for sell? The Orbit Printer or rather referred to as AllSeasons Orbit is a printer designed for printing Christmas ornaments, baseballs and other commemorative ornaments. And that's not just it, the AllSeasons Orbit additionally prints the wrap around the entire ball, ornament, or bat/drum stick. "The AllSeasons Orbit Printer is a real profit machine. Imagine buying ornaments for less than 50 cents and selling them for $10 to $20 each! Ornaments are not just for the holidays. Ornaments have been printed commemorating church anniversaries, town celebrations, forget-me-not bulbs for military personnel, pet memorials, you name it. If you supply stand ornaments can be used for desks, end tables, book shelves, or night stands." Available for the price of $4,995, the AllSeasons Orbit Printer is an interesting printing equipment for those who want to find a venture when he/she can earn money. For more information about the All Seasons Orbit Printer, you can visit http://www.texsourceonline.com/p-3068-orbit-printer.aspx. While, if you're looking for ink cartridges to use for your holiday expenses, then save your money by choosing eco-friendly ink cartridges at TonerGreen.com. We take pride in the superior performance of our products compared to the average compatible or remanufactured cartridges found on the internet. That is because quality is strictly imposed every step of the remanufacturing process until our products are either picked up by customers or shipped to their address. 100% Guaranteed.